We like big yellow tractors here at The Lego Car Blog, seeing as we’re basically overgrown children, and that’s exactly what we have for you today! The slab of yellow magnificence pictured here is a JCB Fastrac 4220, as built by previous bloggee Technic BOOM. 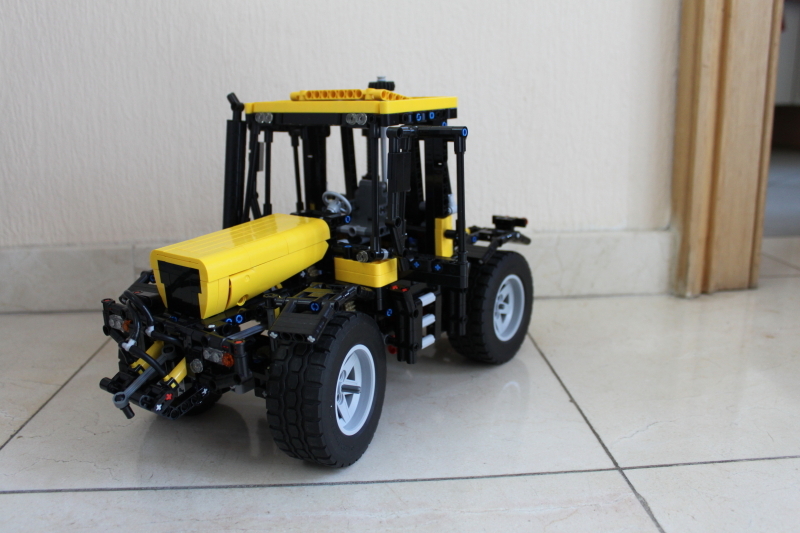 Like the real machine BOOM’s Technic Fastrac features all-wheel-drive and all-wheel steering, operable remotely via LEGO’s Power Functions system. There are eight motors in total, powering the aforementioned drive and steering, a high/low gearbox, and the two raising/lowering hitches mounted front and rear, the latter of which includes a power-take-off too. It’s a quality bit of kit and there’s much more to see at Technic BOOM’s Flickr photostream and via the Eurobricks discussion forum, where you can watch a video of the Fastrac in action. Click the links to take a look. PC or Mac? Ford or GM? Edward or Jacob? These are the questions that have dominated our age. However since 2008 a new and even more important choice has arisen, one that has conflicted the minds of academics and that has caused lifelong friends to stop talking. So… Linear Actuators or Pneumatics? Bias alert: in the Linear Actuator vs. Pneumatics debate I am conclusively in the former group. Feel free to send your “dear idiot letters” to thirdwigg.com, I can handle it. After the release of the Large Linear Actuators (LA) from 8295 and 8294, it was clear to me they were an improvement over pneumatics. They had a simple design, better integration with Power Functions and manual controls, actual mid-range control, and no clunky hoses to connect and manage in your model. But I still felt like something was missing after the LAs. Something shorter, smaller. When we first got teasers images of 8069 I was excited. Did it have what I was looking for? Like most sets, this one comes in a box. You have to open it. It has parts in it. 609. And it costs $60. The tyres, buckets and stickers are loose in the box, along with two loose instruction manuals for the A model. B model instructions are online. All you need to know about new parts in 8069 is that it is the first set that included Mini Linear Actuators (mLA). You get four of them. You also get two yellow panels (they are kind of rare, it turns out), the buckets, lots of gears, yellow parts, and the mLAs. They are great. Great. The build starts with the chassis and the front steering, then quickly onto building a worm gear submodel. “What’s this” you think? It’s for the bucket tilt. We’ll come back to this. Two mLAs are used to provide the bucket lift. Then off to the rear, where you start building a complex structure of gears for the rear bucket. The design is good, and teaches many gear structures including worm and bevel gearing. It also offers a great lesson on how to build good cross supporting structures in Technic when the rear supports are added. You then build the cabin, which has some nice details. Next all the rear backhoe controls placed on the top and the backhoe is added with a neat little design for the two stages of movement utilizing two of the mLAs. Finally the fenders are added, the front bucket is placed, you add the wheels, and you are done. TLCB Team were quietly working* away in the office today, when the sound of much commotion floated up the stairs from the Elves’ cage room. Sigh. A despondent traipse downstairs revealed the cause, and Mr Airhorn was brought out of his slumber to restore order. 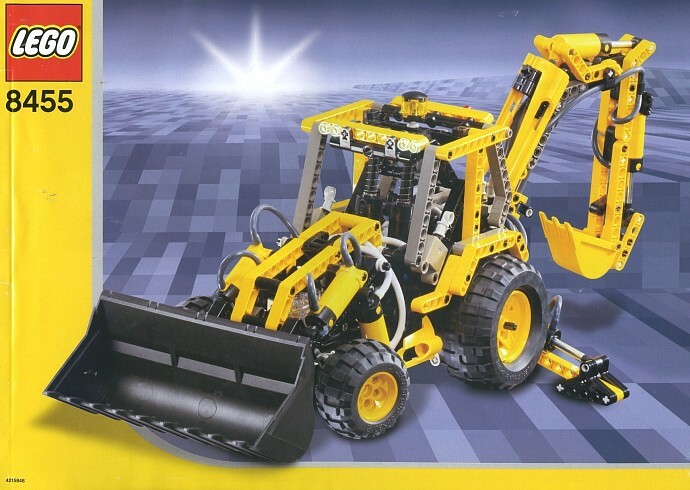 The Elves have a history with remote controlled construction machinery, and this excellent JCB 320T compact track loader by Brickshelf’s pipasseyoyo did nothing to re-write it. The JCB’s two Power Functions L motors had been used to smush a multitude of Elves into the carpet, whilst its ingenious self-leveling bucket contained a few more and quite a lot of sloshing vomit. Watch this video and you’ll see why – this loader is deceptively quick. Anyway, we have the controls now, and the Elves have been thrown outside to continue the search. You can see more of the JCB on Brickshelf at the link above. *By ‘working’ we mean browsing car websites, eating cupcakes, and Googling images of NFL cheerlea… never mind. 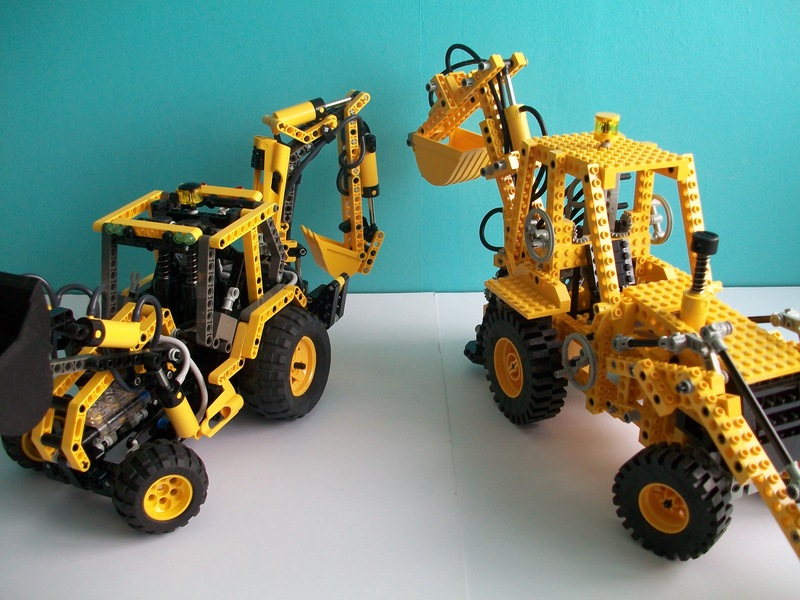 Both of these JCBs sat near the top of the range, and although the Technic range may seem incomplete without one, there has only been these two and the more recent 2011 8069. This latter model was a lot cheaper and not as accomplished as it’s predecessors. It’s a good enough substitute for less cash, although the little 42004 is as well, for a lot less cash. Where were we ? Ah yes, 8862 and 8455. First, the builds. The early one is naturally more basic, with it’s studded Technic beams, although the bigger build steps of these older models keeps you on your toes. It was a rare pleasure to build with brand new, unopened 25 year old Technic in this case – no second hand teeth marks and dog hair to contend with, until I have to pull out those infuriating early tight fitting black pins that is… maybe I’ll get the dog to do it… Anyway, after decimating the value of this 8862, I enjoyed a couple of hours of good old fashioned building. I then cracked open the 8455 (unopened as well!) and gave that my full attention; needed because this little machine’s many pneumatic components, especially the tubing, are VERY compactly packaged. In order to squeeze it’s 10 pistons, 7 switches, 2 pumps and several yards of tubing into a model that’s smaller than 8862, as well as being more functional; you must concentrate at every stage of the instructions on where exactly to route the various pipes and so on. The cleverness of this machine’s packaging is such that not only will it work faultlessly as long as you do this, but all of it’s pipes are very neatly routed on the finished model as well; something that can’t be said of the old stager. With that, it’s a very technical build, not to be rushed. Both of these models came with pneumatic tubing in long lengths that you cut to size yourself. In both cases, it’s important to cut to the lengths specified; even small deviations may cause packaging and clearance problems, especially in 8455. As is often the case, follow the instructions faithfully and you’ll be alright. Round one is a draw. Better proportioned, right-size wheels…. and oddly, probably not yellow enough! There’s no pleasing some people… It does unquestionably look better, though. New technic wins at a canter. As you’d hope for JCB models, both of these are fully functional. We’ll start at the front. 8862 has a system of angled levers and worm gears, manually controlled by wheels on the side, to raise/lower and tilt the front bucket. This system is not perfect. It won’t raise the bucket any higher than the level of the vehicle’s roof, although it does try to maintain the bucket’s angle as the arm is raised and lowered. It almost succeeds… 8455 has pairs of pneumatic rams to operate these functions: there’s a wide range of movement, it’s a strong system and the bucket maintains it’s angle regardless of elevation. The switches on the sides of the seat (if there was a seat) are a neat touch. This seamless operation hands new the win here. 8455 might not have a seat, but there is an engine; geared to turn quite quickly from the rear wheels; and this demonstrates yet more of that clever packaging that so characterizes this model. The steering system – via knob wheels and drag links – works around the engine, taking very little space and it works smoothly, if without quite the precision of 8862’s conventional rack and pinion. 8862 has no engine, despite it’s greater size. Another round goes to new. First impressions are good. The three vehicles do look cute on the box, and they all seem to do stuff. The box is quite elegantly designed as well. There is, however, precious little sign of any B-models shown on it; just one tiny picture of a laptop with a road grader model that looks like the alternate for the front end loader. Said laptop won’t help either, for as I write this, the instructions aren’t up on Lego’s website yet. There are three instruction books and 3 pairs of numbered bags of pieces – one for each model – and a small sticker sheet that managed to survive the onslaught of not being protected by cardboard. Taking each of the three models individually, I’ll start with the blue one. It’s a rather fetching looking tipper lorry, 9 studs wide and it features working steering and a tipping box, the latter raised and lowered by a small linear actuator. It’s not a difficult build, by any means, but it’s an enjoyable thing to put together. You build the front end first, then the box and the chassis rails that hold it all together come last. The resulting model does look nice, especially as attention has been paid to the colour of the fixings and blue ones have been used on the cab where possible. So, it’s pretty, but is it clever ? In a word, no. The steering is rather vague and imprecise with a very limited lock, and the tipper bed has a few too many holes in the bottom – a shame as it did seem from the pictures that they might have designed this properly for once. It does work OK, though, and the hinged flap at the rear opens as it goes up. It’ll open before it goes up as well, unfortunately; there’s no means to lock it shut. So, an aesthetic success but not a technical one. Next! A little red excavator, which wears stickers on the side that somewhat redundantly say ‘Excavator’, just in case we weren’t sure… this features another little linear actuator to lift the arm and it’s extended manually via a set of simple crossed levers. This aspect works well, and it’s got a control to rotate the body on the base. This is completely pointless as the thing will swivel around of it’s own free will anyway. If it was geared down it might have worked. It’s got a pair of caterpillar tracks, using the older, small black chain link type – 40 per side so get clicking! – and I always like seeing these, although they appear to be made of a softer plastic than used to be the case. These need gears at each end to act as sprockets, and this model doesn’t have that – the chains simply slide over the ‘sprocket’ provided by pairs of bevel gears that don’t mesh with them, meaning the tracks have some free side-to-side movement, and will slip over the sprockets. They won’t slip right off, though. So, a partial success and, like the truck, it does look good. The best of the three is undoubtedly the yellow front end loader. This looks very purposeful with it’s big yellow wheels, with new squarer tyres that’ll suit most of your truck mocs very well – and it features articulated steering and a lifting, tilting bucket at the front. The joint in the middle is very sturdy, it steers nice and smoothly and the bucket’s lifting mechanism is fine, although the bucket itself tips back as it goes up. The tilting action is a bit sloppy, however, and could not be more basic. That aside, this is a good model. Whereas each of 42023’s models have 2 or 3 functions/moving parts, 42004 has 6 on it’s own, in a model that’s the same size. These functions are not perfect, but they’re at least as good as any similar systems on 42023. All this and cuteness; can’t ask for more. So, to sum up, I should probably have bought the Skip Lorry… 42023 is a nice enough set, and it would make a very good starter kit for someone new to Technic, but there’s not really enough here for the seasoned builder at this price. 6/10. 42004 on the other hand, is an outstanding little model that looks even better value now. 9/10. This is the Lego Car Blog. We make these mistakes so you don’t have to! MAN TGX & JCB. Other acronyms available. Ralph Savelesberg aka Mad Physisist is back, and his latest work earned a lucky Elf two meals! * Found on Flickr, Ralph’s MAN TGX truck, complete with rear-steer trailer, is hauling an ace looking JCB backhoe. To see the full gallery click here. *Said Elf tried to argue that the trailer counted too, but it was robustly repelled with a stapler. Insert dirt for twice the awesome. This engineering marvel is the work of pipasseyoyo on Brickshelf. Featuring ten separate functions, this Technic Caterpillar backhoe can do everything its real-life counterpart can, thanks to eight Power Functions motors and two gearboxes. See it in action below! A big extension. We’re childish. Power Functions to the max!